Source: CICH graphic created using Government of Canada. The Well-Being of Canada’s Young Children. Government of Canada Report 2011. http://www.dpe-agje-ecd-elcc.ca/eng/ecd/well-being/sp_1027_04_12_eng.pdf – accessed May 22, 2017. 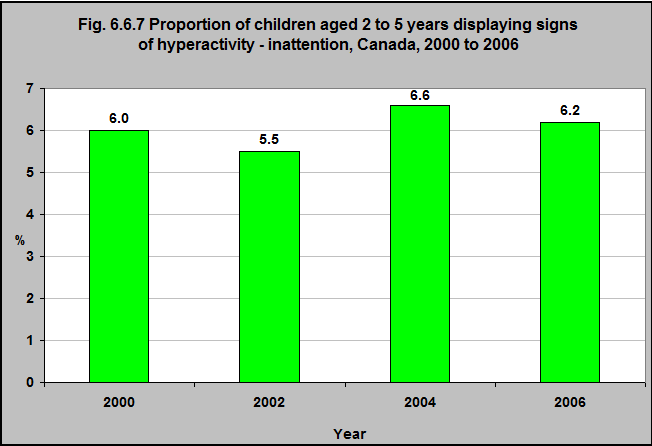 In 2006, 6.2% of children from 2 to 5 years of age displayed signs of hyperactivity – inattention. This was 6.0% in 2000, 5.5% in 2002 and 6.6% in 2004. These are disorders that affect the neurological system and brain – for example attention-deficit/hyperactivity disorder (ADHD), autism, learning disabilities, intellectual disability, conduct disorders, cerebral palsy, and impairments in vision and hearing. 1Abelsohn AR and Sanborn M. Lead and children: Clinical management for family physicians. Canadian Family Physician June 2010 vol. 56 no. 6 531-535. 2Environmental Protection Agency. Children’s Health and the Environment Third Edition. 2013. https://www.epa.gov/sites/production/files/2015-06/documents/ace3_2013.pdf -accessed July 24, 2017.